Windows 10 Education is available just for education customers in volume licensing programs. Windows 10 Education includes features from Windows 10 Enterprise that are ideal for advanced security, and the comprehensive device control and management needs of today’s educational institution. Windows 10 Education also enables simplified deployment in the education space; this edition provides a direct path for many devices to upgrade from Windows 10 Home or Windows 10 Pro. Windows 10 is your partner in making things happen. Get faster start-ups, a familiar yet expanded Start menu, and great new ways to get stuff done even across multiple devices. You’ll also love the innovative features like an all-new browser built for online action. Familiar and easy to use. The familiar Start menu is back and better than ever. And Windows works with more hardware and software. Automatic updates keep you updated. Fast and smooth. Windows 10 starts fast, resumes fast and runs apps so smoothly. New Battery Saver lets you work and play longer. Windows 10 compatibility. Compatible with programs that run on Windows 7 or Windows 8/8.1. And your docs and files are preserved. A warm welcome. With Windows Hello, your device greets you by name and lets you log in with just a look or a touch – no need to type in a password***. All-new browser. Microsoft Edge is an all-new browser where you can even write**** or type on webpages and easily share with others. More multi-doing. You can easily snap up to four apps on one screen and create virtual desktops when you need more space. One place for all your stuff. Access one place for all your photos and files on the go with OneDrive online storage. Epic gaming. 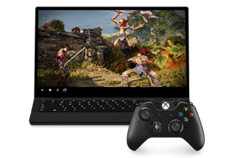 From casual games to intense multi-player scenarios, PC gaming is at its best on Windows 10. Get stunning DirectX 12***** visuals, the best games to play, and Xbox built-in**. Great apps built-in. Windows Store is your one-stop shop for great free and paid apps, games, movies, music, and TV – all certified by Microsoft*. Join your Domain. You can connect to your school Domain to use network files, servers, printers, and more. Enhanced encryption. Enhanced security with BitLocker data encryption and protection. Remote log-in. Log in with Remote Desktop to use your PC from anywhere. Virtual machines. Create and run virtual machines to run more than one operating system. *App and content availability and experience varies by market. **Some games and programs might require a graphics card compatible with DirectX 10 or higher for optimal performance. Xbox app require Xbox Live membership. *** Windows Hello requires specialized hardware, including fingerprint reader, illuminated IR sensor or other biometric sensors. *****DirectX 12 only available with supported games and graphics chips.